"This is a rich, delicious dip that can be served with tortilla chips or slices of toasted French bread. It can be easily substituted with fat-free ingredients for all of you health freaks out there! It's an absolute hit at all parties. Here are a few suggested garnishes: shredded Monterey Jack cheese, chopped red bell peppers, parsley, sliced mushrooms, or bread crumbs." 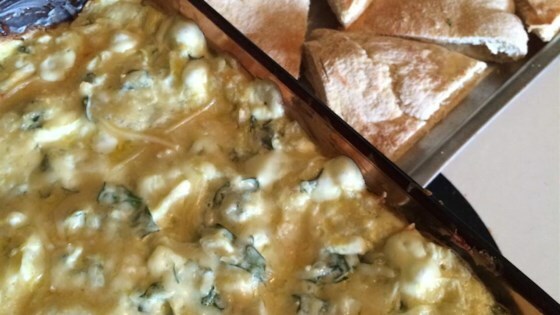 In a small baking dish, mix together artichoke hearts, spinach, sour cream, mayonnaise, cream cheese, Romano cheese, and garlic. Cover dish. Bake until heated through and bubbly, about 25 minutes. A friend brought this to a party yesterday and we loved it!!! I'm looking forward to making this myself! The spinach flavor is not overpowering which I liked!